This was an interesting find for me. I also just recently read another quote that someone had posted on Facebook, regarding the fact that we are responsible for the choices we make and no one else. What I find interesting is the fact that during the holidays, I had a rather heated debate regarding whether or not people had choices. My stance was that while we don’t necessarily choose what life throws at us, we always have the choice regarding how we react. The other party didn’t agree. Sometimes life is cruel and bad things happen to really good people, but I’m sorry to say, “that’s life!”. We can choose to let these crappy things ruin us or we can choose to rise back up. We may feel that we have no control over the intense emotions we may be experiencing, but the fact is, we always have a choice, at every moment, to choose how we feel or will continue to feel. 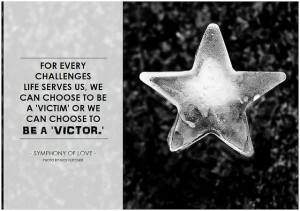 Just as today’s quote pick states, “We can choose to be a victim or we can choose to be a victor”.